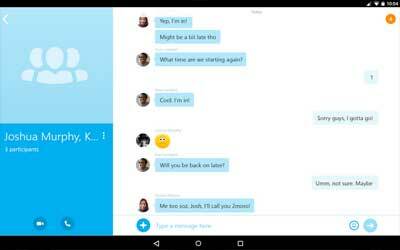 Previous version Skype 7.45.0.598 apk for Android will help you to downgrade or install older app easily. This is one of the best Communication apps. First of all, let’s talk about the good of the application. So the latest build for Android platform is pretty much excellent with its impressive audio quality and an overall fantastic quality of video call. It also runs pretty smoothly despite having so much features and data to be processed. If user has used the application for a long time, between updates, it can be seen that the quality of the application is getting even more stable than how it is previously. This gradual, stable improvement is what makes it possible to have smooth video chat and video calls. However, there is also some cons of this app. It is still lacking in group video chats and the features of transferring file between each Skype users is still difficult. There is also no way to change between rear and front camera during the session of video chats or calls. All in all though, whether you are a user or not, the new version has plenty of amazing features and impressive qualities which counted to be something worth your time and considerations. Great app! Improved alot. The glitches I had has been fixed.